Cristiano Ronaldo shared a picture of himself and another man standing in front of Insparya Hair Clinic with a .
Cristiano Ronaldo has launched a Hair Clinic, Insparya, and it is coming on a day UEFA said he would face hearing on Thursday for over celebration after he scored one of his goals against Atletico Madrid. One thing Cristiano Ronaldo loves doing is changing his hair style from time to time and this love may have inspired the World Footballer to own a Hair Clinic. 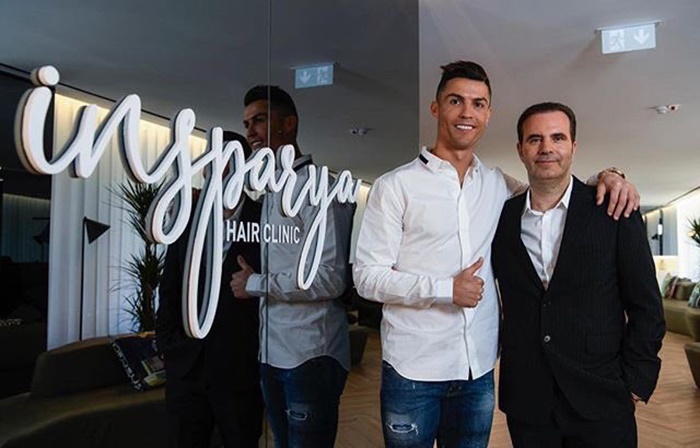 On Monday, Ronaldo said Insparya Hair Clinic has officially started. In a post on the new business line for the Juventus player, he said: "It Is officially the start of a new project, @insparya_es a unique project and we trust that it will be very successful!". This launch is coming on a day that a disciplinary action was instituted against him for his celebration after one of the three goals he scored in last week’s 3-0 win over Atletico Madrid in the Champions League. Atletico coach, Diego Simeone, had clutched his trousers in the first leg of the game after his team scored Juventus. He had turned to the crowd and clutched the part of his trouser that houses 'manhood'. In the second leg of the game, Ronaldo made a similar gesture to Atletico coach Diego Simeone.